It’s the first of July and it is HOT here in Portland. And what’s better on a hot day than a cold beer. Nothing, except to be in Portland in July sampling beer. In Beervana, July is officially deemed beer month and you can find a beer function every day somewhere in town. We fell in love with Portland at Bridgeport Brewing 23 years ago. Back then, this now grandfather of Portland craft beers, was a hemp warehouse(they made rope here) in the old warehouse district, now called ThePearl. Among the half million dollar condos Bridgeport still brews beer. And it’s good. 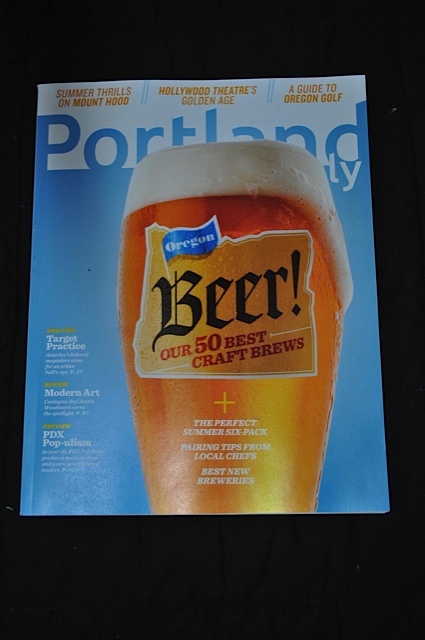 Today my Portland Monthly arrived. A perk for being a member of public radio- thanks OPB. Sure enough, the local magazine proclaims July beer month. If I took anything away from this issue, other than getting thirsty, is that Portland’s breweries economic impact on the city is nearly $2.5 billion. So to beat the heat, let’s go grab a beer at the pub and help the local economy.